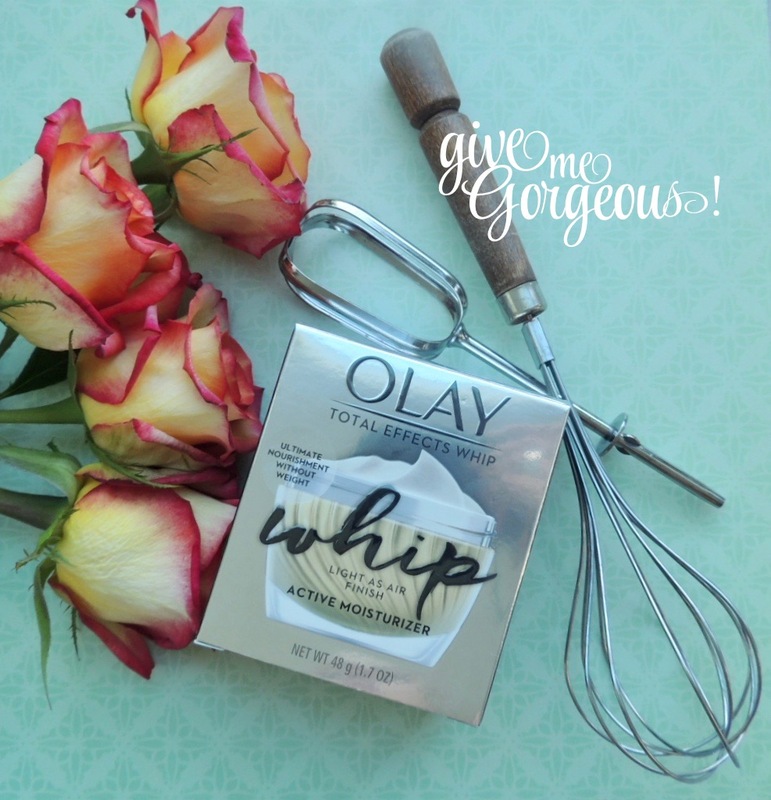 OLAY Total Effects Whip active moisturizer - Give Me Gorgeous! After seeing the ads for @olayskincare ‘whip’ moisturizers I had to give one a try. Especially, since they are said to absorb faster than much more expensive skin care brands. Of the three formulas they offer I chose the Total Effects Whip (they also have versions: Regenerist and Luminous). I selected Total Effects of the three because it claims to have 7 benefits, and seemed to be the most moisture focused of the three. The 7 benefits are that it: moisturizes, evens skin tone, brightens, smoothes the look of fine lines & pores, restores firmness and reduces the appearance of dark spots—All, good things. As you can see, this moisturizer is white in color. It is very watery in texture, has a slight sweet smell (pleasant) and does virtually ‘melt’ into skin. The Olay term for this ability is Active Rush Technology. Which means, that the whip transforms from a cream to a liquid on skin. The ‘whipped’ texture is also supposed to help this cream to absorb instantly, which it seems to do quite well. And, it then gives skin a matte finish. Plus, this version in particular is recommended to be used as a makeup base. And, Olay also now has versions of these with SPF25 which is especially good if you want this to be your layer with sun protection. The thick plastic container sits nicely in the palm of my hand. The silver lid screws on and off to keep it secure. I picked this up at Target for $28.99 (which is pretty pricey for a drugstore brand, the SPF versions are just $1 more expensive). But, I am really happy with this product so far. It is not greasy, and after I use it on my face at night I wake up with plumped and soothed (no redness visible) skin. Vitamins C & E are the main ingredients that treat skin with moisture. Regenerist (which got a People magazine Beauty Award in 2017): This one is an anti-aging formula that is supposed to reduce the appearance of fine lines and wrinkles. Again, it is weightless, absorbs immediately, matte finish and is breathable. Luminous: This one’s main promises are to even skin tone and minimize the appearance of pores. And this one too has all the benefits of the Active Rush Technology. I really think the Total Effects may be the best of the three ‘whips’ offered. As far as I can tell it has the most benefits of the three. *If you happen to use one of the other two, particularly, drop a comment to let me know which one and if it is working for you—if it helps you #FaceAnything. 🙂 Would also love to know if others are loving this one. btw, The orange and yellow roses in these photos were selected for their warm fall colors. I hope everyone is enjoying the changes in the weather and season. The holidays are coming!